Growing abundantly in the tropical climates of Africa, northern Australia and southern Asia, the henna plant has been used in body art for over 5,000 years. The peoples of ancient Egypt and India were known to use it for temporary tattoos in religious ceremonies, wedding festivals and even as a style accessory. Traditions come and go, but henna remains as popular as ever. Larissa Russell’s business, The Henna Hut, uses their own blend of organic Henna paste (made from the crushed leaves of the Henna plant) to create pain-free temporary tattoos, lasting 7-21 days The freestyle drawing of these tattoos is a skill that demands years of practice and dedication, and it’s a skill Larissa has turned into a successful business. Larissa’s business, The Henna Hut, has been operating since 2010 but preparations began long before that. It’s often said entrepreneurship is a lifelong calling, and it’s one Larissa started training for at an early age. “I consider myself creative and industrious, and I learned those skills from my amazing mom, Shari Russell,” Larissa explained. “Growing up, she kept a room full of craft supplies and little treasures. And, if anything was ever broken or needed to be crafted, she could whip something up from those supplies. She taught me that there is always a way to mend or build something, and this has come as an incredibly useful skill when operating a small business. The Henna Hut specializes in hand-drawn temporary body art. Larissa grants a talented group of artists the freedom they need to create stunning henna, glitter and Dark Mark tattoos. This confidence in their abilities is the cornerstone of the business and has provided the roadmap to continuing growth. “We are run by talented student artists, providing them with meaningful work and much-needed summer jobs,” said Larissa. “My main resource has always been our amazing artists. Their ideas and feedback are so valuable to me and have shaped The Henna Hut into an amazing business. The biggest lesson I’ve learned is the importance of feedback for sure. The life of an entrepreneur is filled with ups and downs. It’s a lot of hard work, but the rewards make the endeavour more than worth it. Larissa’s one piece of advice for aspiring entrepreneurs? Just go for it! “It can be a very scary thing to forge your own path and give up a stable 9-5 career,” she explained. 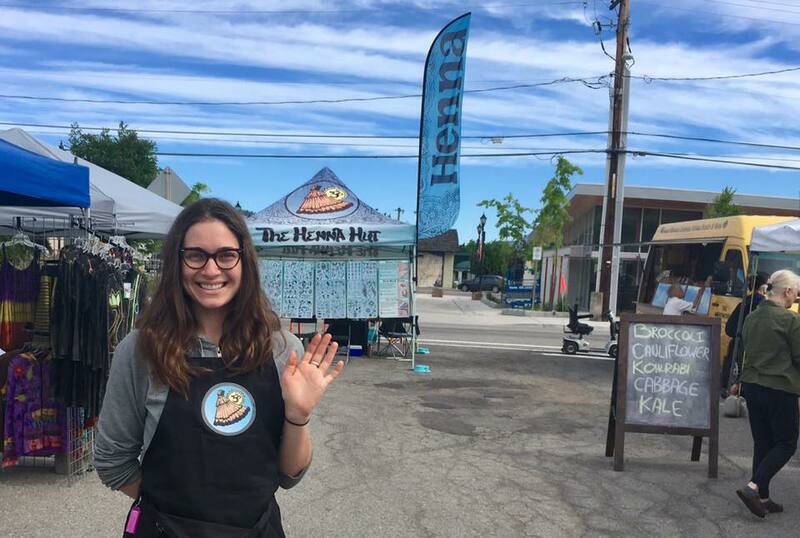 In 2017, Larissa and The Henna Hut were finalists in the Small Business BC Awards. Like many before them, participating gave the business deserved recognition as well as increased media exposure. “Being a finalist in the Small Business BC Awards has provided an amazing boost for the business,” Larissa said.